For the life of us, we couldn’t understand what Rudy Giuliani was doing on Hannity talking about Stormy Daniels and the money to Michael Cohen. It made no sense to us. And it was hurting our brain. So we decided to offer a stress-free ScuttleButton puzzle this week. It’s only fair. Gold for Goldwater — Barry Goldwater was the 1964 Republican nominee for president. 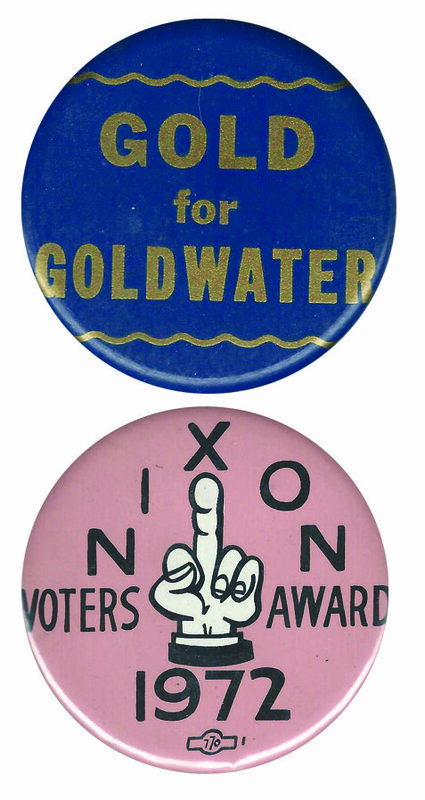 Nixon Voters Award 1972 — The big middle finger shows where the sentiments of this button lie. Goldfinger. The great James Bond movie from 1964. The randomly selected winner is … Cheryl Lindstrom of Edwards, Colo. Cheryl wins the coveted Political Junkie button.